My fiancé is obsessed with BJs. And no, I’m not talking about the sexual act. I’m talking about the store. The damn bulk warehouse store. I, on the other hand, as you can probably guess, am not obsessed with BJs. In fact, I devote a significant portion of each day to actively loathing BJs. The quantities: we are not running a summer camp. We are not running a general store (which, coincidentally, is what we’ve taken to calling our stash of cleaning supplies: The General Store). We are simply acquiring groceries for two average sized, decently in shape adults. When we get a dog and/or have kids, I will revise my opinion but until then do we really need a bag of cucumbers? No one has any business eating that many cucumbers, unless they’re turned into pickles, in which case they belong in a single, solitary jar. The free boxes: Because BJs sells a lot of Things-in-Boxes, they provide additional free “boxes” for you to put your smaller boxes into under the false pretense of making it easier to lug everything back to your car. But the free boxes aren’t really boxes. They’re weird box-like trays. They usually only have walls on 2 sides— 3 if you’re lucky— and said walls are about as tall and structurally sound as a sand castle built by a toddler. A drunk toddler. I hate them. I hate them more than life itself. What? What’s that you say? I could simply take the flattened tray/boxes out to the recycling bin myself? And I know this because I tried it once. But no sooner had I wrangled the mass of paper-cut inducing cardboard into the recycling bin than one of its many evil tentacles caught on my necklace (a necklace that PIC bought for me, no less) and almost very nearly pulled me to my death. I could have been asphyxiated. On another note, I’m pretty sure that our proximity to BJs was the main (and possibly the only) reason that PIC decided to move in with me. I’ve never run out of toothpaste. I don’t have to blow my nose on dirty laundry any more. I can, if I want to, but I can also use a tissue from one of the many boxes conveniently placed around the house. I have a choice now. Our soap never runs out. And this is a particularly joyous development because soap is tricky. You realize it’s gone as soon as you get into the shower, but by then you’re already wet so it’s hardly the time to go scrounging around for a replacement, so you wash a little less thoroughly than usual and make a mental note to replace the soap as soon as you finish your shower but by then your mind is onto other things (like, what’s for breakfast? And, do I have enough time to shave my legs?) and before you know it, it’s the next morning and the vicious cycle of “F*ck! No soap?? ?” begins again. But that never happens any more. We always have soap now. He is such a good provider. I almost can’t believe it sometimes. And I love him for it. Ha ha – love it. Haha, this made me laugh! 🙂 I feel the same love-hate for those stores but I’m dragged through there at least once a month too. Thanks for sharing! I agree, I have two kids and I still think the targeted consumption of BJ’s is terrible. You can’t eat that amount of anything; or clean that amount of anything. And the box of the box of the box that you carry these things in = added waste! What are we doing to our planet people! WHAT! I know. Technically the box/trays are “recycled” from having carried other boxes but I still don’t why a single grain of cereal needs to be encased in a plastic bag, then put into a box, then paired up with another box and put into a larger box… and so on and so forth. Is this like an East Coast store thing? Like Costco but over there? Such a Californian here. 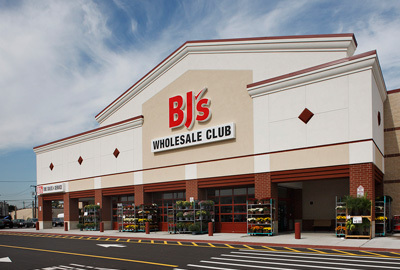 Yeah, as far as I can tell BJs is basically the equivalent of Costco. The name just cracks me up like I am a twelve year old boy.